The electric bus in Bangalore on Thursday. 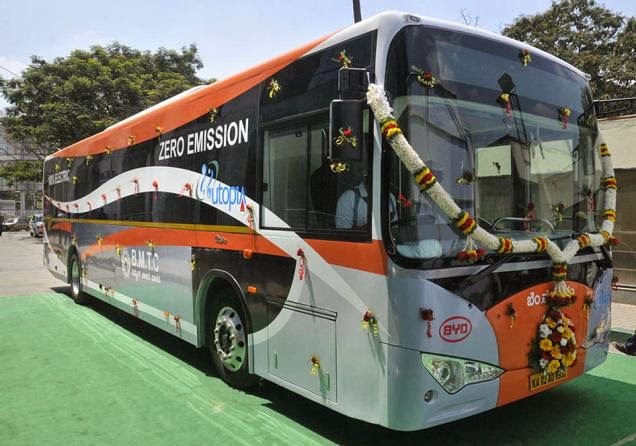 An initiative taken up by Bangalore Metropolitan Transport Corporation (BMTC), in co-ordination with Utopia, the air-conditioned 31-seat coach has a range of 250 km with a full battery charge (four to six hours). The BMTC will operate the bus on trial basis for three months between Kempe Gowda bus depot and Kadugodi. It will be used on other routes subsequently. Mr. Ramalinga Reddy said that with zero emission level the bus will be eco-friendly. “The bus will run on free trial basis for the first three months, following which the BMTC will decide on its purchase. The passenger fare will be equivalent to the Volvo bus fare,” he said. He said that the bus is expected to cost Rs. 2.7 crore. The bus, manufactured by BYD Auto, has two sliding doors and two roof hatches which could serve as emergency exits and two CCTV cameras in the saloon area. Apart from this, there is a small hammer attached next to the windows for every row on either side for passengers to break open the glass in case of emergencies. The battery management system also monitors the voltage and temperature of the electric cells to ensure safety. BMTC managing director Anjum Parvez said that the bus comes with a fire detection system. “There are sensors that will detect a spark or smoke and this will be automatically indicated on the dashboard to alert the driver,” he said. About tinted glass on the bus, Mr. Parvez said that the model is manufactured that way but if the BMTC decides to purchase it, specifications will be adhered to. There is a camera and electrically adjustable mirrors for rear viewing. There is also a ramp for wheelchair-bound passengers.